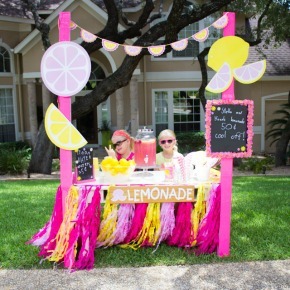 Kids Week: The Coolest Lemonade Stand! 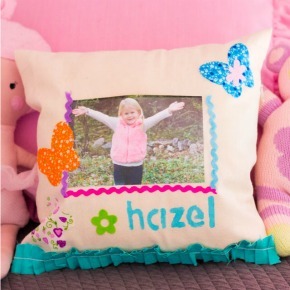 It’s Kids Week Part 2! 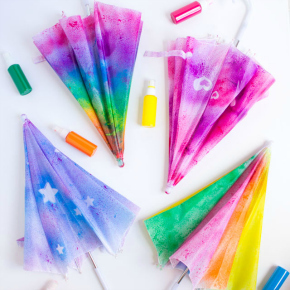 I had so much fun sharing some kid-approved ideas with you last week, that I thought we could keep the fun going. 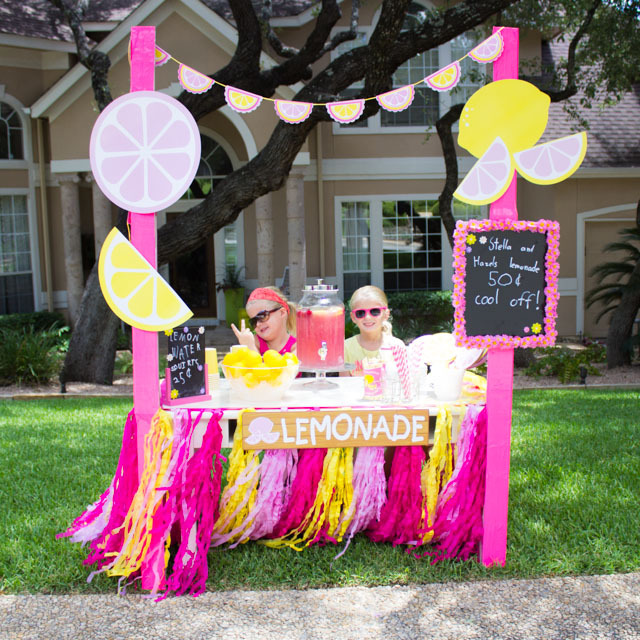 This lemonade stand is a project I’ve been meaning to share since last summer when Stella and Hazel had the coolest lemonade stand in the neighborhood! They raked in the business thanks to a hot July day, their secret recipe lemonade, and some eye-catching decorations from Oriental Trading. 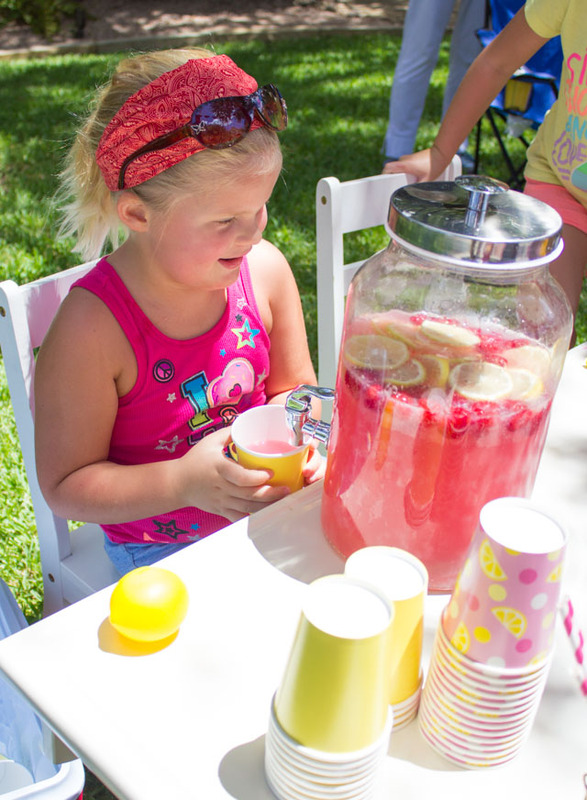 Holding a lemonade stand has become an annual summer tradition for us, and this one will be hard to top. 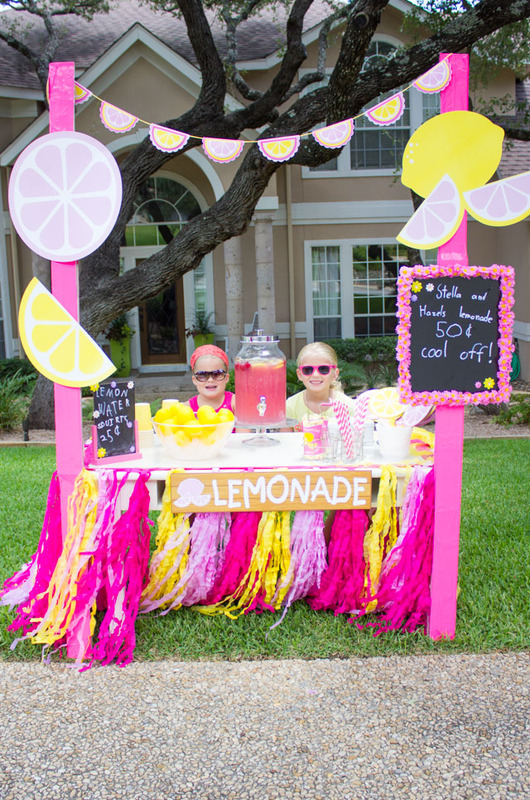 Read on for some ideas for holding your own lemonade stand! This simple lemonade recipe contains a kid-loving ingredient (Sprite!) that was the key to our success – get the recipe here! We found that it helps to divide up responsibilities. Hazel was in charge of filling up the cups with lemonade while Stella collected money from the customers. I think Hazel chose this job so she could refill her own cup as needed throughout the afternoon. 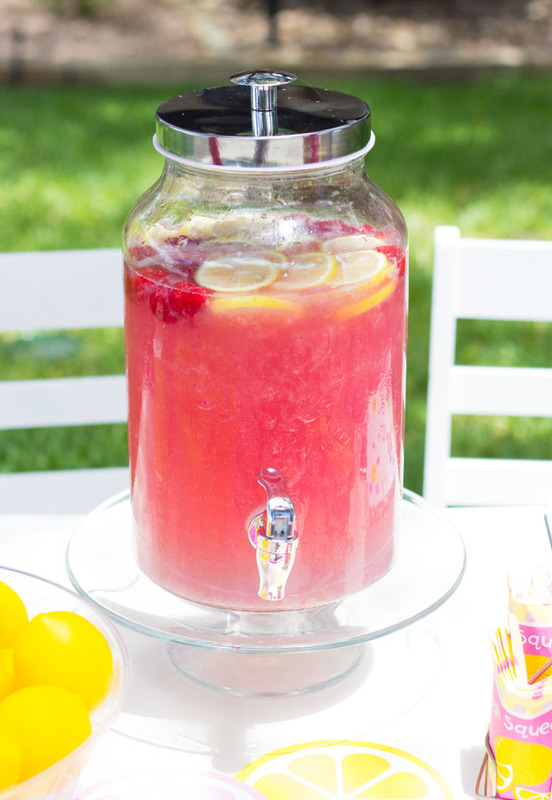 Our special recipe sparkling pink lemonade was hard to resist! You can find the recipe here. 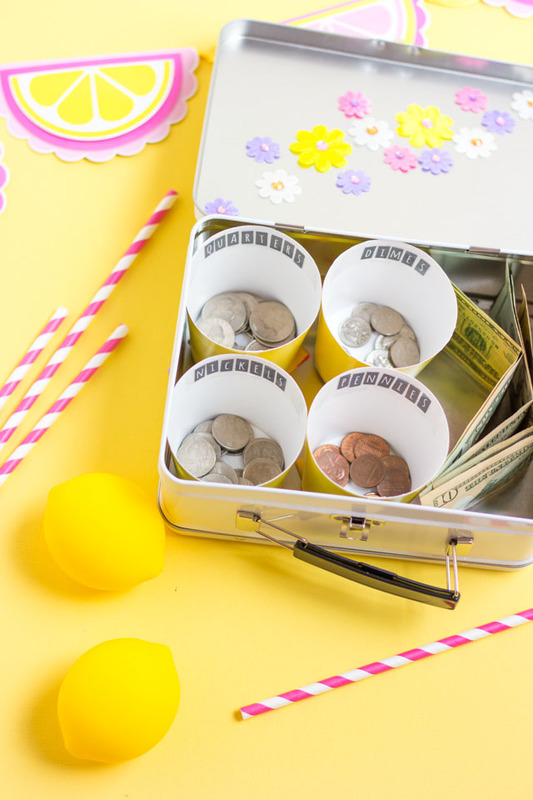 The girls and I made a special money box out of a tin lunchbox that I filled with paper cups to separate change. 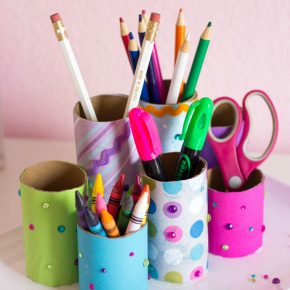 It helped keep their money organized and turned out really cute! 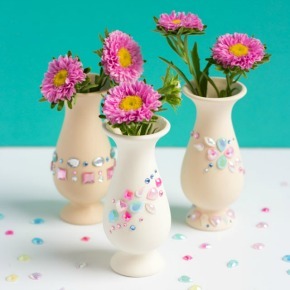 You can find the step-by-step tutorial here. It helps to make sure you have plenty of $1 and $5 bills along with quarters ahead of time to use as change. I totaled up the money I put in the change box before the lemonade stand, and made sure the girls subtracted that from their total earnings! 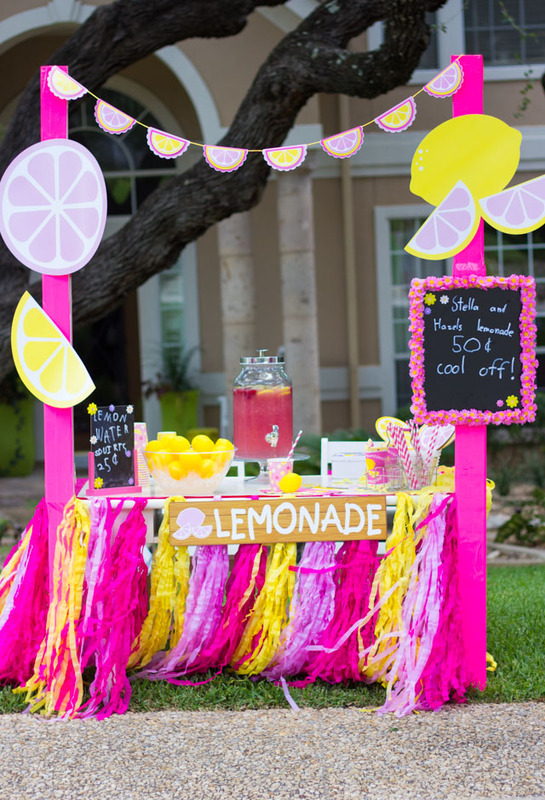 We made sure our lemonade stand was hard to miss with lots of bright colors and signage. We also waved at every neighbor who drove by! 😉 The stand was made by combining the girls’ play table with a couple long pieces of cardboard covered with duct tape to use as the sides of the stand. 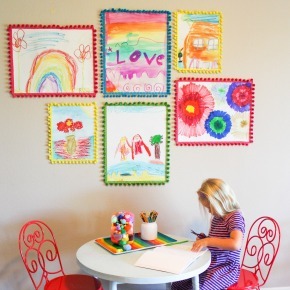 You can find a step-by-step tutorial for the lemonade stand here. I decorated it with these big lemon cutouts. 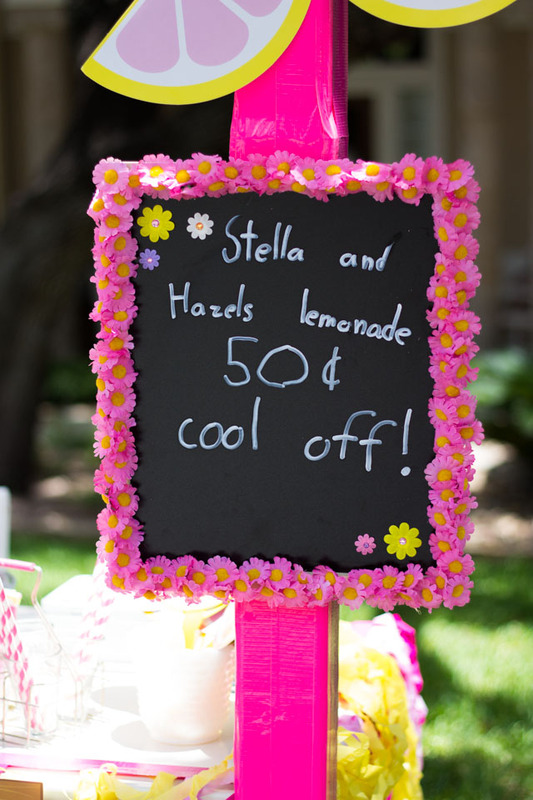 I also took a basic chalkboard and decorated it with pink daisies to hang on the lemonade stand for the girls to post their prices. 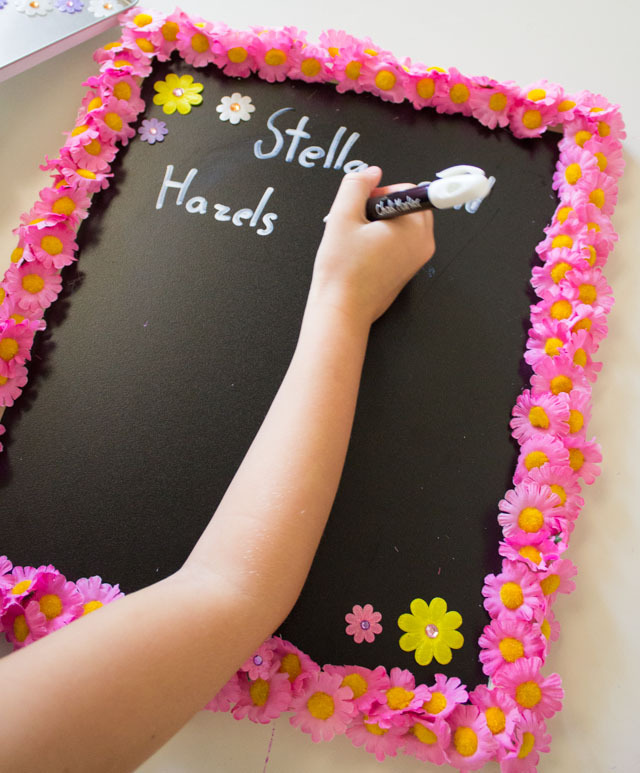 You can find the chalkboard menu tutorial here. 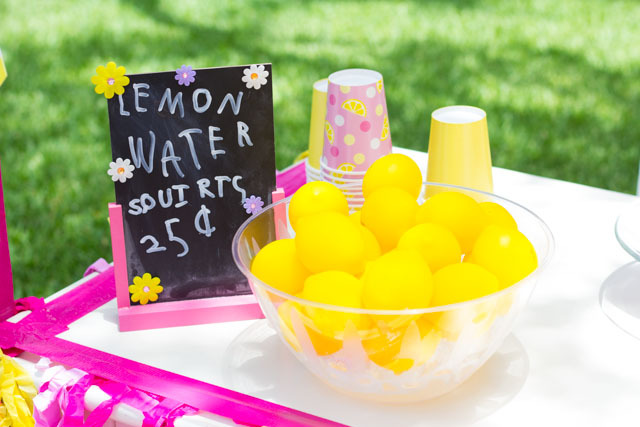 In addition to our delicious lemonade, we also offered these lemon squeeze toys filled with ice cold water. 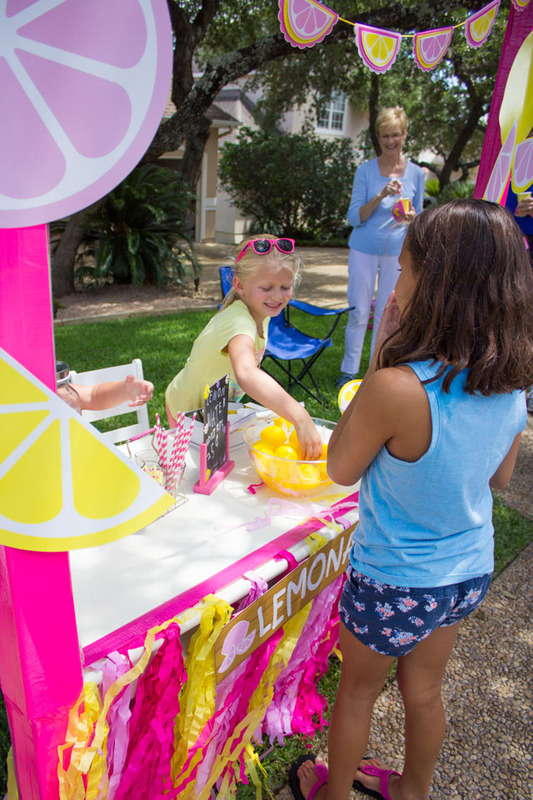 It was such a fun way for our guests to cool off and the lemons couldn’t have been more perfect for our lemonade stand. Stella and Hazel used them to keep themselves cool throughout the afternoon as well! 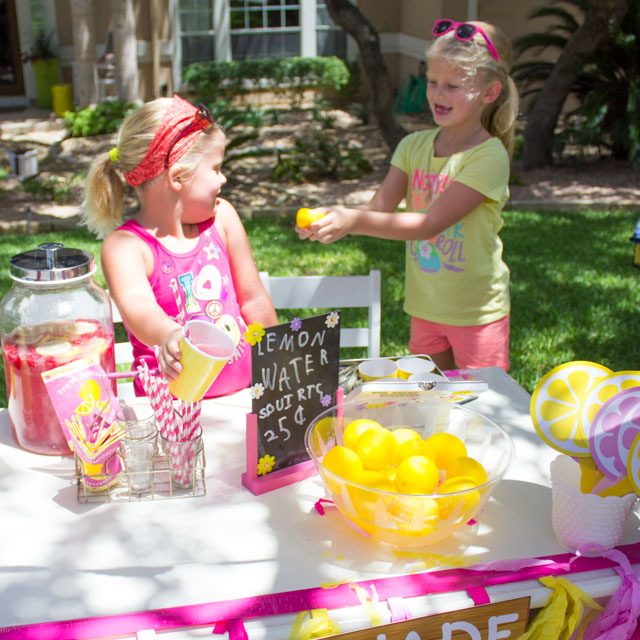 Having a lemonade stand is a great way to get neighbors together that haven’t seen each other in awhile. We were all outside talking long after the lemonade ran out! 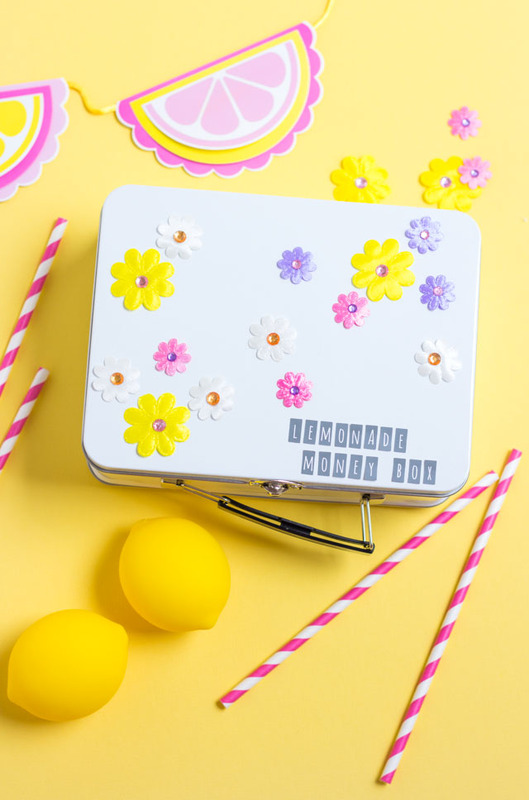 Head to Oriental Trading’s blog for a full list of supplies, the sparkling pink lemonade recipe, and step-by-step tutorials for the lemonade stand, chalkboard menu, and money box!